The internet and devices that connect to it are powerful learning tools. Our students need to learn to work independently in order to develop their digital skills. However, they also need to learn how to use this digital learning tool safely. The Academy has both the technology and processes in place to protect children while using the internet in school. This includes filtering what they can access, tracking what they do (or try to) access and maintaining records of their computer use more widely including emails sent and received and, on occasion, taking 'snapshots' of their screen. We have online safety advice in classrooms, formal lessons in online safety and a process by which any problems that do arise can be dealt with appropriately. All users of the Academy's ICT facilities are required to sign the Acceptable Use Contract (AUC) before they are granted access to the ICT facilities. 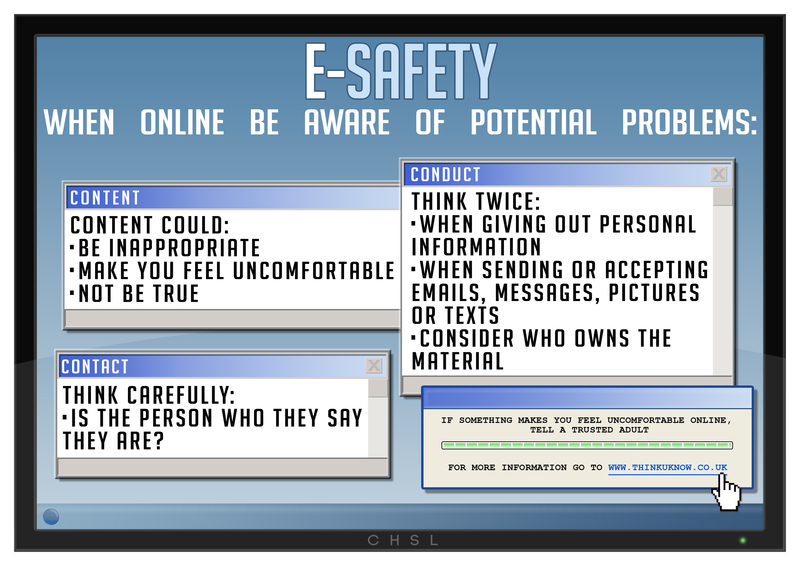 The AUC provides a summary of acceptable use and provides advice to help users stay safe online. The following advice is issued to all students. Content – may be inappropriate and make you feel uncomfortable. Information on the internet may not be true. Contact - meeting someone you have only been in touch with online can be dangerous. You should always talk to a parent or carer before doing this. Cyber-bullying is as hurtful as face-to-face bullying. Conduct – don't give out personal information. Accepting emails, messages, pictures or texts can cause problems. Sending these, including on social networking sites, can also cause problems. Think before you send. Always consider who owns material online and if you have a right to use it. Tell your parent, carer or a trusted adult if someone or something makes you feel uncomfortable online. For more information on safety, including extremism, please go to www.internetmatters.org click on 'Issues' and 'Radicalisation'. The following advice is issued to parents/carers should they think it useful. "Leaders foster a family approach across the school, which staff and pupils embrace. This has created an exceptionally positive ethos and strong climate for learning."